Get your campfire going and put your marshmallow on a stick, being careful not to pierce the bottom. Hold the marshmallow side 2-3 inches over the fire. When it begins to smoke and brown, turn it again. Brown all sides of the marshmallow evenly, excluding the top where the stick is. Use the second stick to hold the marshmallow on while browning the bottom. Slide the marshmallow off the stick onto a plate and allow to cool completely. The inside will implode naturally. through the marshmallow. 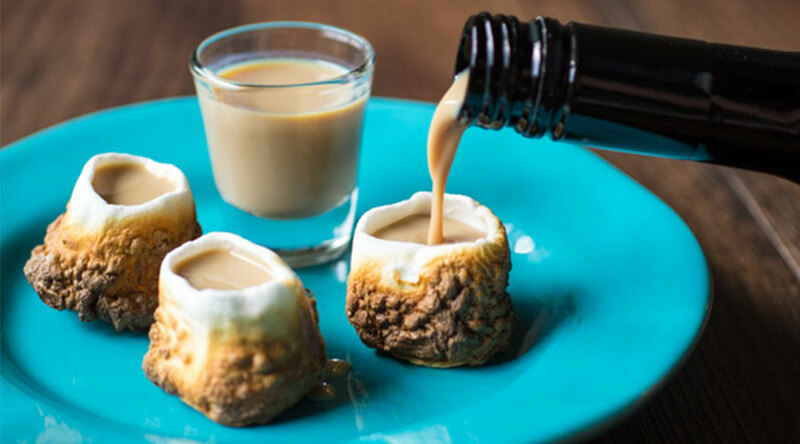 (You can also just dunk your marshmallows into a cup or bowl of Baileys’ to get that same great taste a little easier). -Toast all sides of the marshmallow evenly so you don’t get thin spots. -Have a fire extinguisher handy…seriously. This is dangerous. -Don’t burn the marshmallow too bad or the walls will get too thin. -Putting marshmallows in freezer to cool faster doesn’t work. -Only pour liqueur when ready to shoot, otherwise it will just soak through. -Make sure to have a plate underneath or you’ll have a big mess. -Don’t forget to eat the marshmallow after. YUM. Sticky, soppy, alcohol-y mess! !